As you may know, I'm a part-time teacher and a full-time geek. So, while some teachers get apples, I receive little pranks like this. That's what was on my marker board this morning when I walked in. So awesome. Yes, there's a spelling error. I don't care. 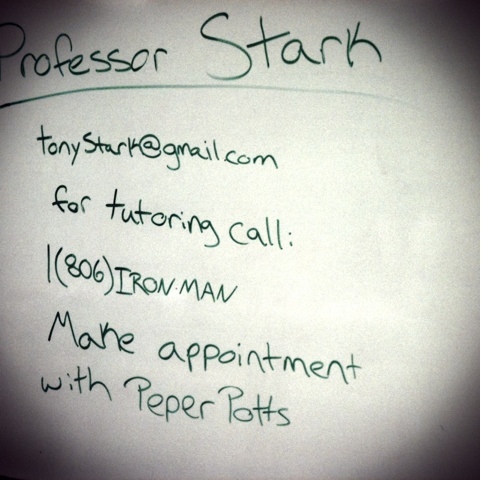 The main thing to know is this: we called (806) IRON MAN, and the number is out of service. Which means, somebody might be able to snag it, and become the Texas Iron Man. There's a happy thought to start your Tuesday. As for me, I have the best students ever. Update: Class briefing case Texas v. White, 74 U.S. 700. The students crack me up. Student 1: Professor, why does the court keep using "she"? Me: That's the court referring to Texas. Student 1: Texas is a woman? Student 2: Sure is. That's why you don't mess with Texas. If it was a man, we wouldn't have warning signs at the state line.